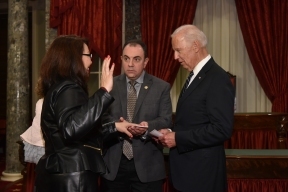 Just a few minutes after noon in the U.S. Capitol Monday, former Member of the U.S. House of Representatives and former Assistant Secretary of the U.S. Department of Veterans Affairs Tammy Duckworth was sworn in as Illinois’s newest United States Senator by Vice President Joe Biden. Following the official swearing in ceremony, Senator Duckworth and the Vice President were joined by her family for a traditional re-enactment inside the historic Old Senate Chamber. “I was proud to be sworn in today to represent the great state of Illinois in the United States Senate. I am eager to get to work — with members on both sides of the aisle — to help Illinois families with common-sense policies that grow manufacturing jobs, invest in communities that have been ignored for too long, rebuild our crumbling infrastructure, and help make college more affordable for all Americans,” said Senator Duckworth. “I will also continue my life’s mission of supporting, protecting and keeping the promises we’ve made to our Veterans and ensuring we fully stand behind the troops we send into danger overseas.” After she was sworn in, Senator Duckworth spoke briefly about her priorities in the Senate. Duckworth begins her six year-term in the Senate as a member of several influential committees: Environment & Public Works; Energy & Natural Resources; Commerce, Science, & Transportation; and Small Business & Entrepreneurship. These committee posts will provide the Senator with an important platform to push for Illinois priorities like rebuilding our state’s infrastructure, keeping the water system safe and lead-free, helping grow minority- and Veteran-owned small businesses, investing in advanced manufacturing and championing Illinois’ crown jewels of scientific innovation: Argonne National Laboratory and Fermilab.